The Royals, the team that refused to go away, defying the greatest odds night after night this postseason, will go down as one of the most relentless teams of this generation. The way it ended last year, with everything that happened,’’ Hosmer said, “it was such a magical run. You knew it couldn’t end like that. The ending of that story had to be way better than losing Game 7. “Just to have the opportunity to come back with the same core group of guys, and have another chance to compete for a world championship is special in itself. “We believed in each other, and we definitely made the most out of the opportunity. 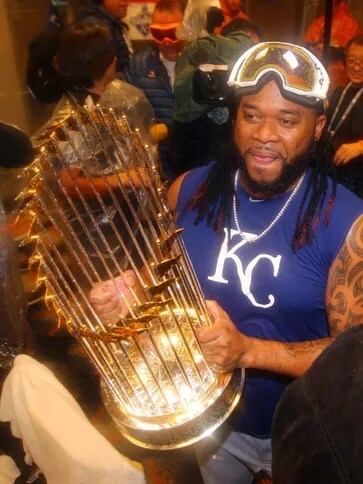 Christian Colon drove in Jarrod Dyson, sparking a five-run 12th inning by which the Royals won the 2015 World Series with a 7-2 victory over the Mets. Colon was only the third player to drive in the World Series-clinching run as a pinch-hitter. Ironically, the first was current Royals first-base coach Rusty Kuntz, as a member of the 1984 Tigers. Kuntz delivered Kirk Gibson with a fifth-inning sacrifice fly to give Detroit a 4-3 lead that it never relinquished. The other pinch-RBI to clinch a World Series was by Gene Larkin of the Twins in 1991. Colon was also the first player to drive in the Series-clinching run on the first World Series plate appearance of his career. Kansas City’s five runs in the 12th broke the World Series record for runs in one inning in extra innings. The previous mark was four by the Mets in the 12th inning of Game 2 against the A’s in 1973. Kansas City hit only two home runs in the 2015 World Series-solo shots by Alcides Escobar andAlex Gordon, both in Game 1. The Royals were the first team to win a World Series with only two runs scored on homers since the 1950 Yankees.